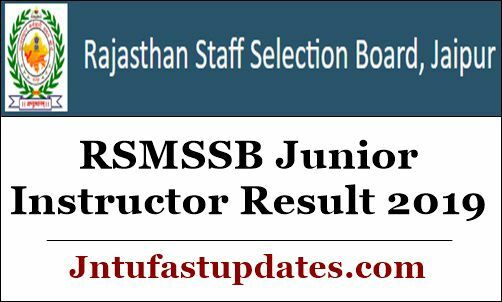 RSMSSB Junior Instructor Result 2019: Rajasthan Subordinate and Ministerial Services Selection Board (RSMSSB) Junior Instructor written test has been held from 23rd March to 26th March in many exam centers across the Rajasthan state. The RSMSSB conducted the exam in morning and afternoon shifts. All the aspirants competed for RSMSSB Junior Instructor written test can download the answer keys from the RSMSSB official website, rsmssb.rajasthan.gov.in. The organization unveils the answer key after 3 to 4 days of the examination. Hence the candidates can download RSMSSB Junior Instructor answer key and compare the answers with it to check the probable score. After downloading the answer keys candidates can check the answers with the corresponding set to estimate the score. Candidates competed for the written test and waiting for the results will have to check the RSMSSB official website for more updates. The organization is soon going to announce the result date. For more updates, go through the following article. Rajasthan Subordinate and Ministerial Services Selection Board (RSMSSB) is the state government organization that releases various recruitment notifications every year. RSMSSB released junior instructor notification for 402 vacancies. The organization accepted lakhs of applications from eligible and interested aspirants this year. Many of the hopefuls seeking to get state government jobs have applied for RSMSSB Junior instructor posts. RSMSSB is going to shortlist the aspirants based on their performance in the written test, and skills shown in the interview round. Candidates qualifying both rounds with good merit will be finally shortlisted for the RSMSSB Junior instructor posts. The organization is expected to release the results in the month of April, as per reports. Hence the competitors who have given the test from 23rd March to 26th March can wait for result date. Stay checking the RSMSSB official portal, rsmssb.rajasthan.gov.in to check more updates about the result date. The organization will soon announce the result date and other updates. Candidates competed for the junior instructor written test can download the cutoff marks/qualifying marks of the examination. The cutoff marks/qualifying marks will be decided based on various factors such as the number of posts, number of competitors, and various other factors. RSMSSB Junior Instructor cutoff marks category-wise and section-wise will be released. Candidates have to score the cutoff marks in all scenarios to clear off the examination. RSMSSB Junior Instructor Merit List 2019 will be released with the candidate’s names who cleared the examination with required cutoff marks. RSMSSB will announce junior instructor result, cutoff marks, and merit list at a time on its official portal, rsmssb.rajasthan.gov.in. Candidates Minimum Qualifying Mark in the Exam is 40% . rsmssb.rajasthan.gov.in – Is the official portal of RSMSSB. RSMSSB Junior Instructor Result 2019 Link appears on the homepage. Click on the link.